Looking for Zoom Teeth Whitening in Norco? At Premier Dental we know your smile is important. It's one of the first things you notice when meeting someone for the first time. 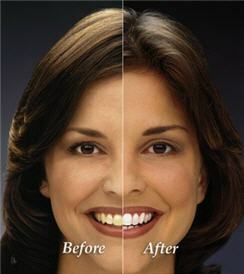 A whiter, brighter, beautiful smile can improve your self-confidence and help you to make a memorable first impression. There are many reasons attributed to the staining or yellowing of teeth. This process can be caused by tobacco use, drinking coffee, tea, and soda. However, this can also happen naturally. The natural aging process and even prescription medication use can also cause yellowing and graying of the teeth. Teeth whitening (or bleaching) is a simple, non-invasive dental treatment used to change the color of natural tooth enamel to a more desirable shade. Zoom!® Whitening is a perfect solution for people that want a quick and affordable teeth whitening treatment with instant results. One of the many advantages of the Zoom!® teeth whitening system is that it only requires one office visit! Many of Dr. Lam's patients see their teeth up to 8 shades whiter after only one treatment. The convenient Zoom!® teeth whitening system is perfect for the individual, tired of using whitening strips or messy, bleaching trays without seeing the results they want. Whiter teeth have become the number one aesthetic concern of most patients. Teeth whitening will only work on natural tooth enamel. It is important to evaluate replacement of any old fillings, crowns, etc. when considering teeth whitening. Replacement of any restorations will be done after bleaching to better match the newly bleached teeth. Other whitening systems don't compare to the Zoom! Chairside Whitening System. Nothing whitens better or faster. Looking for other cosmetic dentistry procedures? Visit our cosmetic dentistry page to learn more about the services we offer.